Why do glass materials or the objects behind them appear black or gray in photorealistic images? 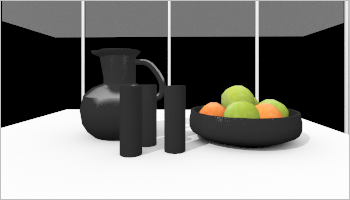 Glass objects and the objects behind them appear as black or grey in photorealistic renderings. 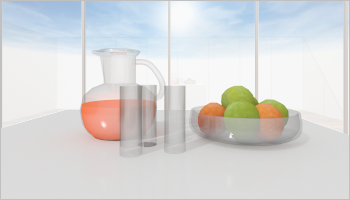 This issue is connected to the relation between the number of transparent objects in a planning and the ray depth used for the rendering process. The ray depth determines how often a ray of light is reflected within the scene. If your planning contains many translucent or glass objects, the default ray depth will not send enough rays of light through the glass. This leads to a less realistic look of these glass objects. A higher value for ray depth will send the ray of light through the scene repeatedly. The issue can occur when rendering either with OSPRay or Yafaray. Enter a higher value for Ray Depth. We recommend to set it to 10. In addition it can be useful to reduce the Refraction Index for your glass material to 1 (setting found in the Material Editor under Transparency). This way, all rays will go through the glass instead of being reflected at the surface.